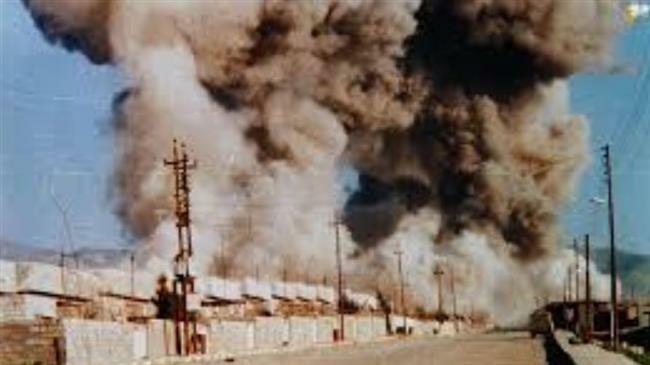 The US, UK, France and Israel were all complicit in disseminating the patently false accusation that Iraqi President Saddam Hussein gassed the Kurds in 1988 in the Kurdish city of Halabja in Iraq. He didn’t. Nor did Hussein ever admit to such an atrocity as it was reported by the mainstream media. As a matter of historical fact, the alleged ‘genocide’ never even took place as claimed by the Western powers. That’s not to say that the Halabja chemical attack did not occur. However, if poisonous gas was used by any side of the conflict, the attack was conducted as a classic false flag operation by those who wanted to demonize Saddam Hussein. It’s now clear that the most powerful NATO militaries routinely blame ‘enemy governments’ of terrorist acts that they have actually committed. Whoever does not strictly follow the dictates of the Zio-Franco-Anglo-American Axis is soon of accused of gas attacks against their own people. This MO of course is very much a Neocon Zionist propaganda ploy regularly utilized by the MSM in order to corral the American people into a pen of war-making consent. Without the military support of the U.S. government, the unending wars throughout the Middle East and North Africa could not be waged with swift success. For this and other reasons, American blood and treasure is frequently wasted in prosecuting these transparently unlawful wars. In point of fact, every single armed conflict in the Levant involving the USA was started as an unprovoked act of naked military aggression by the Neocon Zionist warmongers in Washington, D.C. The extremely grim predicament in Syria reflects this stark reality. The following video is a MUST VIEW for those who want to understand the back story of these U.S. imperialistic pursuits: General Wesley Clark: “The US will attack 7 countries in 5 years”. N.B. What follows is an insider’s views of how President Saddam Hussein was practically accused, tried, convicted and sentenced for a war crime that he never committed. Many crimes against Iraq have been justified by the demonization of Saddam Hussein. Invasion was justified by claims that he possessed “weapons of mass destruction,” had ties to al-Qaeda, and posed a threat to the territorial United States. The claims turned out to be lies. There were no “weapons of mass destruction” or programs to develop them. There were no ties to al-Qaeda. He did not threaten U.S. territory. Those who still support the occupation now say it was justified because Saddam Hussein was a “brutal dictator.” One of the main complaints against him is that “he killed the Kurds.” The usual reference is the Anfal campaign of the Iraqi army from February 23, 1988 to September 6, 1988. It is claimed that Anfal was a campaign of genocide. It can now be said that the “Anfal genocide” never happened. It is another lie. Ironically it is the second of the illegal U.S.-run “trials” of Mr. Hussein in Baghdad that allows this conclusion. The facts and circumstances of the “trial” can be analyzed without any concession to the legitimacy of the “court.” Nor, since it is illegal, is there any reason to wait for the “court’s” findings before reaching one’s own conclusions. Applicable principles of international law are presented in Appendix A. Certain facts are not in dispute. The campaign took place in the late stages of the Iran-Iraq war. The Iraqi army fought units of the Iranian army in Northern Iraq. Kurdish guerillas called peshmerga allied with Iran against the government of their own country. In order to suppress the guerillas the Iraqi government displaced large numbers of Kurdish civilians from border areas. Press reports say the current charge is genocide during Anfal. By any definition the crime of genocide means the extermination of large numbers of people. At first no definite number of civilian fatalities was given in news reports, but in September the “prosecution” was several times reported to say there were 182,000 deaths. The “trial” on the Anfal charges began on August 21, 2006. There were 13 sessions of the “court” between that date and September 26, at which time it recessed. See Appendix B for the tabulation of articles. In the press reports studied for this analysis no statement or presentation of methodology was reported. No systematic studies were reported. No sworn affidavits were reported. No expert testimony was reported. Evidence of this kind would have been front-page news. It can be concluded that no such evidence was introduced. The death of an infant is a very bad thing. Still, the number of fatalities definitely averred by Mr. Hama is one. He also admitted that there was guerilla activity in his village. Genocide is a large-scale crime against civilians, meant to exterminate an ethnic group. Thus Mr. Hama’s testimony did nothing to establish genocide. Another witness heard the same day was not even reported to have made any definite statement of fatalities. Between August 22 and September 26 the news reports speak of seventeen witnesses. Definite statements of fatalities came to a total of 43. Some of the fatalities could have overlapped. No attempt to differentiate between civilian and military casualties was reported. Of the fifteen witnesses three admitted to having been peshmerga guerillas, whereas genocide is a crime against civilians. One of the three former guerillas, Moussa Abdullah Moussa, now lives in Tennessee. Another witness, Katrin Michael, now lives in Virginia. One of the witnesses, Mahmoud Hama Aziz, testified on September 9 to 7 fatalities at an unstated location in 1987, prior to Anfal. The New York Times reported the next day that evidence bearing on Mr. Aziz’ testimony had been found in a mass grave discovered in 2004, whereas the “prosecution” claims investigations have been going on since 1991 (see Doebbler, below.) The timing of the “discovery” is so convenient as to raise still more doubts. Twenty-one of the 43 fatalities including the Balisan incident occurred in 1987, before Anfal. That leaves at most 22 during the Anfal period or at times not stated. The question arises as to what happened to the other 181,978 of the 182,000 claimed victims. At this rate it will take about 689 years to account for the alleged fatalities. Hence in the first month of proceedings the “prosecution” presented no case at all. The original trial judge was removed for political reasons on September 20 (see below.) Later sessions descended from farce into chaos. Defense lawyers boycotted the “trial” on orders of Mr. Hussein. Anonymous “witnesses” gave testimony behind a screen; documents were stolen from defense attorney Badia Arif Izzat in the courtroom building, and so forth. The prosecution has had all the time and opportunity needed to formulate a case. The alleged events occurred eighteen years ago. Northern Iraq has been out of Baghdad’s control since 1996 when the Clinton administration unilaterally imposed the “no-fly” zones on Iraq. Nor has there been any lack of investigative expertise and money. The New York Times reported on July 1, 2004 that “The Federal Bureau of Investigation is leading the investigation, along with the Bureau of Alcohol, Tobacco and Firearms and agents from the Justice Department.” The NYT also said on July 20, 2005 that the U.S. had spent more than $35 million on the investigations. Other circumstances support the same conclusion. The charges are not even clear. None of the cited news reports give more than the word “genocide.” The specification of charges might answer some questions. A moderate effort found a document termed a “charging instrument” for the first “trial” of Mr. Hussein, the Dujail case. It is posted at: http://www.law.case.edu/saddamtrial/documents/20060515_indictment_trans_saddam_hussein.pdf. Charges for the Anfal “trial” were not posted at the same site, however. Repeated internet searches using “charging instrument” and/or other search terms failed to find the corresponding prosecution statement for the Anfal “trial.” Hence the “prosecution” case is not easily available. It is apparent that the Bush administration and the “prosecution” do not want their case to be known to the public. The violations of unfair trial are too numerous to mention here, but include almost every provision in article 14 of the International Covenant on Civil and Political Rights that could be violated at this juncture of the proceedings. . . . The prosecution alleges to have been collecting evidence since at least 1991 – which, of course, could only be true if it were the United States government doing the collecting – and has at least been doing so since April 2003 when dozens of American lawyers and Iraqis who had not lived in Iraq for years were shuttled in to build a case. The defense lawyers, despite requesting visits with their client since December 2003 when he was detained, have to date not been allowed the confidential visits that are necessary to begin to prepare a defense. No visits were allowed with the most senior lawyers until after the trial had started and at each visit American officials exercise the authority to read any materials brought into the visiting room despite the fact that all meetings remain under close audio and visual surveillance. As if this were not enough, evidence has been withheld from the defense lawyers. They have been denied access to investigative hearings; they have been denied prior notice of witnesses, and they are prevented from even visiting the site of the alleged crime. If any sound “prosecution” case was possible these abuses would be unnecessary. Mr. Hussein’s defense team has been denied physical security despite repeated requests. During the first “trial” three of his attorneys were murdered. During the current “trial” legal assistant Abdel Monem Yassin Hussein was murdered. He was kidnapped on August 29. His body was found five days later. The murders of defense personnel argue further against the possibility of any “prosecution” case. In court, Mr. Hussein jumped up to defend himself. Five days later the judge was removed. If the alleged events of 1988 had really occurred it is extremely unlikely that the puppet “government” would again have discredited itself and the “trial” with this shameless interference. Even more extraordinarily, an AP report on August 21 said that “the trial does not deal with the most notorious gassing – the March 1988 attack on Halabja that killed an estimated 5,000 Kurds. That incident will be part of a separate investigation by the Iraqi High Tribunal.” The report did not say why Halabja is to be treated separately. In the United States the burden of proof is on the prosecution to prove its case “beyond reasonable doubt.” The defects of the “prosecution’s” case are so great as to constitute overwhelming doubt. There is no reason at all to believe that genocide was committed in the Anfal campaign. Only one conclusion can be drawn: the “Anfal genocide” never happened. In all of the years of its war with Iraq U.S. imperialism has had only one significant political success: the demonization of Saddam Hussein. The “brutal, corrupt dictator” line is heard across the political spectrum. Investigation would seem unnecessary. One result is that to a great degree antiwar opinion sees the war in Iraq as no more than a war for oil. It is insufficient to stop without looking at Iraq, but that is what almost always happens. Firstly, the oil already belongs to Iraq. From its side the war has always been a war for sovereignty, i.e., its rights of national self-determination. Since occupation it has also become a war for independence. “War for oil” also raises further questions. There are many ways to get oil. War is the worst way to get it. The question is why U.S. imperialism has resorted to war. There are many countries that have oil. The United Arab Emirates has almost as much oil as Iraq but nothing is ever heard about it. The question is why Iraq is different. Again the answer is that modern pre-occupation Iraq always fully asserted its rights of sovereignty. The war is Iraq is an unjust war for oil versus a just war for sovereignty and independence. The highest questions of any war are questions of historical content and direction, questions of just and unjust causes. Antiwar opinion is most of the time not even aware of these questions. More than anything else it is the demonization of Saddam Hussein that denies the masses a full understanding of the war. The revolutionary significance of Iraq’s great struggle disappears. The linkage of the struggle in Iraq to that of Palestine disappears. Too often the need to support the just and heroic Iraqi resistance becomes lost; too often the necessity to immediately demand unconditional withdrawal of all foreign forces as objectively the only way to end the war becomes lost. Very little about Iraq and nothing at all about Saddam Hussein should ever be accepted on the basis of authority. There are no such authorities in the U.S. government. There are no such authorities in the U.S. media. There are no such academic authorities. There are no such authorities in the antiwar movement. Throw away all “authoritative” ideas about Saddam Hussein! There are only determinations: sound methods, sound concepts, facts and logic, history. On method one can, for instance, look at the Iraqi side directly. Daily accounts of resistance activities are posted in English at: http://www.albasrah.net/pages/mod.php?header=res1&mod=gis&rep=rep. Political statements of the Iraqi Baath Arab Socialist Party and pre-occupation speeches of President Saddam Hussein are posted at http://www.al- moharer.net/ qiwa_shabiya/ qiwa.html. The war will end and can only end in the defeat of imperialism and its expulsion from the Persian Gulf. The people of Iraq are stronger than imperialism. Though the whole world shatter, and well it may, in the end the people of Iraq will win. 1. The invasion of Iraq is a violation of international law. The glaring illegalities of the current process begin with illegal origins. The invasion and occupation of Iraq is widely understood to be illegal. On 5 March 2003, three of the five members of UN Security Council and Germany, which was then a non-permanent member, unambiguously declared that a US-led invasion without further Security Council authorization would violate international law. On 16 September 2004, UN Secretary-General Kofi Annan reiterated what was by then obvious to almost every international lawyer, that the invasion and occupation of Iraq is illegal. In fact, this is a textbook case of illegal aggression in violation of the prohibition of the use of force by one country against another found in article 2(4) of the Charter of the United Nations and under customary international law. 2. The “trial” of Saddam Hussein violates provisions of international law to which the United States is signatory. On 19 March 2003 President Bush Jr. commenced his criminal war against Iraq by ordering a so-called decapitation strike against the President of Iraq in violation of a 48-hour ultimatum he had given publicly to the Iraqi President and his sons to leave the country. This duplicitous behavior violated the customary international laws of war set forth in the 1907 Hague Convention on the Opening of Hostilities to which the United States is still a contracting party, as evidenced by paragraphs 20, 21, 22, and 23 of U.S. Army Field Manual 27-10 (1956). This brings the analysis to the so-called Constitution of Iraq that was allegedly drafted by the puppet Interim Government of Iraq under the impetus of the United States government. Article 43 of the 1907 Hague Regulations on land warfare flatly prohibits the change in a basic law such as a state’s Constitution during the course of a belligerent occupation: “The authority of the legitimate power having in fact passed into the hands of the occupant, the latter shall take all the measures in his power to restore, and ensure as far as possible, public order and safety, while respecting, unless absolutely prevented, the laws in force in the country.” This exact same prohibition has been expressly incorporated in haec verba into paragraph 363 of U.S. Army Field Manual 27-10 (1956).